The Overland Route is that part of the Southern Pacific System running from Oakland Pier, now West Oakland, through Sacramento to Ogden, Utah. The first construction on the route in this study was from Sacramento to Ogden via Promontory (Summit) during the years 1863 to 1869. Soon after 10 May 1869, when the "last" spike was driven at Promontory, the rail line was completed from Sacramento via Stockton and Niles to Alameda Pier, shortly after to Oakland and Gibbons Wharf. From Alameda and Oakland piers passengers were transferred by ferry boat to San Francisco. In the early years after 1869 the Overland Route trains were routed first through Niles, southeast of Oakland, thence via Stockton to Sacramento, later in 1887 from Oakland to Antioch, east of Martinez, to Tracy and Stockton and on to Sacramento. A few years later in 1890 the trains ran from Oakland via Suisun and Davis to Sacramento. After E. H. Harriman gained control of Southern Pacific in 1901 he financed many improvements to the existing plant including many line changes on the Overland Route. Two major line changes were made just east of Reno and just west of Ogden. But other line changes of smaller degree were also made through1913 under Harriman and his successors. These lists were compiled from records found in the Engineering and Public Relations Departments at Southern Pacific. The records are far from complete, lacking many of the earliest timetables from 1863 to circa 1877. 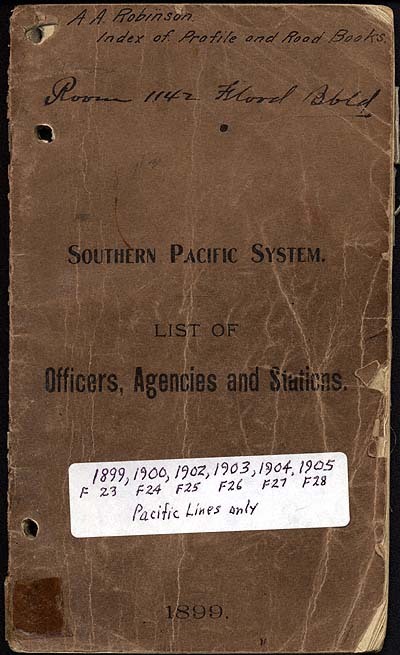 About this latter date the Central Pacific began issuing so-called "station books," officially known as "Official List/of/Officers, Stations, Agents,/Tables of Distances/Etc Etc" issued by the Auditors Office San Francisco (date). The earliest such book found was No. 3 dated March 1, 1879. The books show the stations and mile posts in their order of occurrence along any particular route. Other sources of information were the original engineering profiles of the grading along the center line of the track, track plats (drawings) of stations in existence circa 1875 to 1884 showing all tracks, railroad buildings, etc, and the current (1996) right of way maps showing the tracks, buildings, right of way width, bridges, trestles and culverts, tunnels, etc. In a few instances a station name and date of its opening or closing for public use were obtained from newspapers, etc. It must be borne in mind that the dates shown for a particular station are the dates in the station book or timetable and not necessarily the exact date of occurrence. Thus, in Part Two of Four, Reno is shown at 06/18/68 indicating that was the first time it was shown in a timetable, most probably sometime after its actual date of opening for public use. Only the last two digits of a year are used but the difference between (18)68 and (19)68 should be easily recognizable. Milepost "0" has changed over the years. The first MP 0 was at Sacramento, the depot being on Front Street near I Street. The depot was changed to its present location in the 1880s and again in the 1920s. As soon as the rail line was completed to Alameda, later Oakland, milepost 0 was changed to the corner of a freight house at 4th and Berry Streets in San Francisco. In 1911 milepost 0 was again changed, for all Southern Pacific Lines except the Coast Line from San Francisco to Burbank Junction and the branch lines diverging from it, to the hinge on the apron of the Ferry Building. Mile posts for the stations are shown for the westbound (westward) track where two tracks have different such numbers. The designations of No.1 and No. 2 tracks are not used. List of Officers, Agencies and Stations. 1899.